Chrysler is one of the oldest automobile brands manufactured in the U.S. Chrysler products are available worldwide. Chrysler offers a well engineered, reliable and affordable group of models. Each of our Chrysler convertible tops is manufactured to original pattern specifications and we offer the original fabric selection. Our Chrysler convertible tops will instantly renew your vehicle to show room condition. 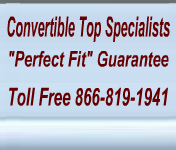 Our replacement Chrysler convertible tops are available for the Chrysler Newport convertible top, Chrysler Lebaron convertible top, Chrysler New Yorker convertible top and the Chrysler Sebring convertible top.